...but my husband did. Every once in a while he gets nostalgic and wants to go walk around the ASU campus and Mill Avenue to reminisce and to see what's new. Today was that day. We left the dogs at home, because 110 degrees is just a little too hot for paws on sidewalks. We ate lunch at a new place since our last visit, a restaurant called Bison Witches. It's supposed to sound like Buy Sandwiches and I suppose it does if you say it fast and with some creative emphases. For $7 we got a full bowl of soup in a bread bowl, a very large half sandwich and a bag of chips. Not a bad deal and very yummy, too! Even though it was a Sunday afternoon in July at a campus restaurant, the place was packed. Campus was empty, Mill Avenue foot traffic was almost non-existent, yet this place was hoppin'. After lunch we walked through campus and Pat pointed out the buildings where he had classes and buildings where he didn't have classes and buildings that used to be parking lots and the Taco Bell that fed him 90% of his college meals. It was so hot that I walked on the grass whenever possible because I could feel the bottoms of my flip-flops melting. 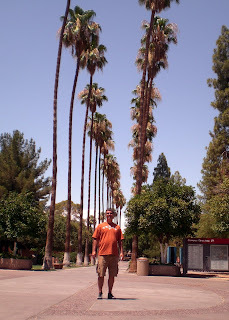 ASU truly has a lovely campus. If I hadn't been so narrow minded at age 17, I would have gone to ASU, too. Somehow, it never occurred to me to leave the midwest. I probably would have done a lot better out here than at the University of Illinois, since here I wouldn't have skipped classes due to it being just too cold to get out of bed and REALLY too cold to think about walking to class. If you were thinking that my lunch was a bit suspect as it contained no dessert, don't worry - we found a cute little place called Cookiez Ice Cream Sandwiches. They had about 10 different kinds of cookies and 10 ice cream flavors. 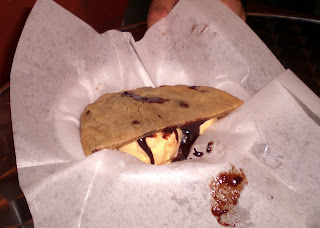 We got the basic chocolate chip cookie with vanilla ice cream and topped it with hot fudge. Mmmm, yummy! 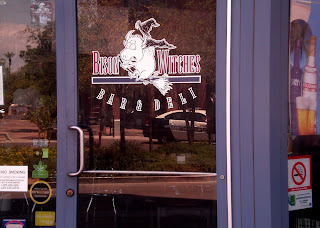 There is a Bison Witches in Tucson, ate there a few times on swing dress excursions, I had to have been with you at least once? Bison Witches is a total UofA spot. I liked our campus better-especially cause I didn't have to live at home! Bear Down. how can anyone feeling nostalgic in 11110 degrees?!?!?! I am convinced that ALL phonecians are crazy for living in a place that hot. R & I are still feeling a little traumatized. I enjoyed jogging in the rain today at about 80 degree something or other.